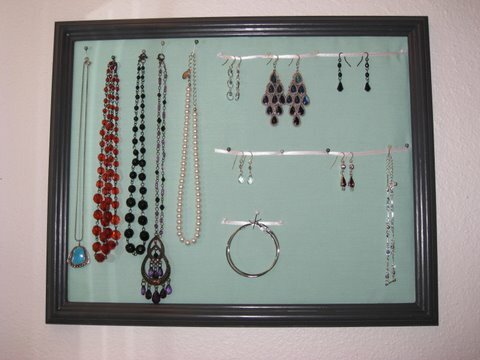 I made a jewelry frame to hold my small collection of earrings and necklaces in the bathroom, using a project from One-Yard Wonders as inspiration. Oh, I just realized I should have taken a Before picture of my jewelry to show the improvement. It used to be a piece of ribbon stuck to the wall with thumbtacks in assorted colors, and before that they usually just lay in a pile on the counter. I bought a white frame for $1.50 at the Goodwill 50% Off Saturday yesterday then painted it the same color I did the dining chairs last month. 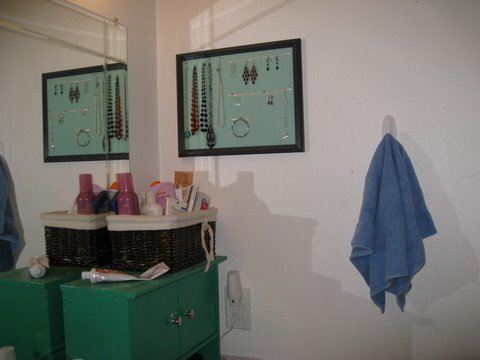 I removed the glass, then covered the mat with a layer of batting and simple sea foam green fabric (the same as the back of napkins I made a couple weeks ago) using the same technique as my quickie swap party jewelry board. Any suggestions on how to reuse the glass I removed from the frame? February 1, 2010. Tags: completed project, One-Yard Wonders, refashion. Pictures, Projects, Words. 1 comment.